At ManageWP, we applaud people who try to do something a little different. New WordPress theme releases are a dime a dozen, but it is the ones that offer something more than just a new skin for your blog that make us sit up and take note. These are of course rare beasts, but we are always on the look out. We are showcasing another five fantastic themes for you today, with two in particular that really caught our attention. Go and take a quick look at the WordPress themes directory right now. At the time of publication, there were 1,543 themes available. That’s a lot of choice. But we are happy to do all the donkey work for you – going through the available options with a fine-tooth comb, and presenting you only with the very best. All of the themes you will see below are either brand new, or newly updated. As such, they are compatible with the latest version of WordPress. They also all have excellent star ratings. But enough chit chat – let’s take a look at these themes. Enjoy! It is always comforting when a theme designer is so happy with their creation that they choose to use it on their own site. Rustic is one of those themes that relies heavily upon imagery, and it certainly does deliver on it’s promised “rustic” feel. There is a little more to this theme than initially meets the eye too, with alternative styles such as “Blue Light”, “Brown Wood” and (intriguingly) “Pink Light” available. It also comes with built-in portfolio capability. This theme retains the simplicity of Twenty Eleven whilst offering up a completely different “mood” for your blog. 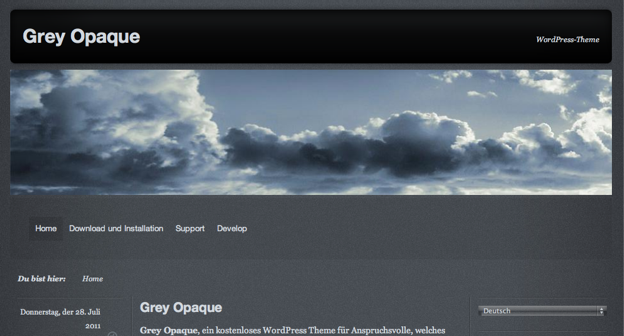 Grey Opaque incorporates post information into a left sidebar, and comes packaged with integrated social sharing buttons. When the folks at Automattic produce a new theme for their WordPress.com platform, you know to expect something of quality. They describe Dusk to Dawn as, “A dark theme that melds old-style organic ornaments with modern design and typography”. We describe it as “looks awesome”. If you’re into your dark/light contrast, then this could be a winner. 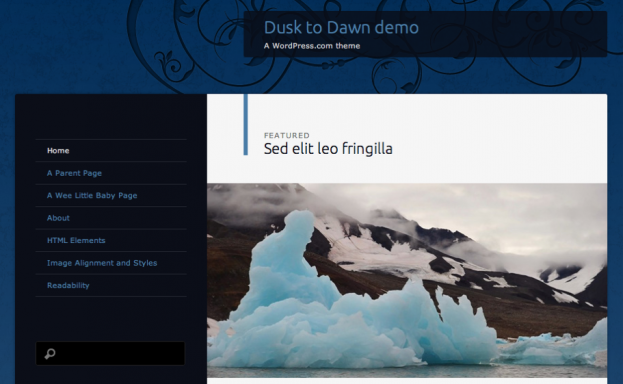 Dusk to Dawn comes complete with various post formats, to give your blog a Tumblr-style feel, if you so wish. 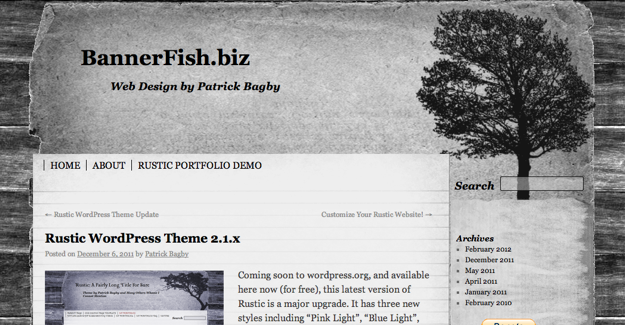 This is the first of two themes this month that offer more than just a fresh blog design. 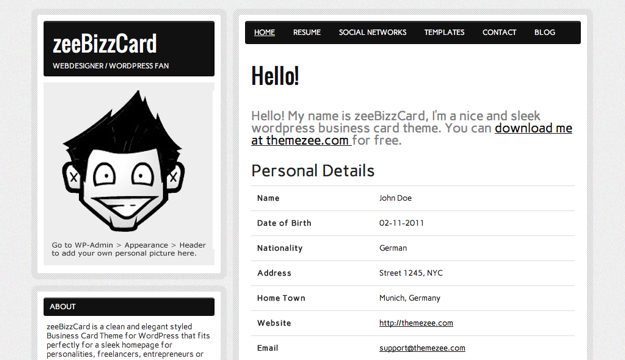 As you might expect, zeeBizzCard allows you to create an online business card for yourself or your business. It offers up a clean and professional-looking design, full social media integration, and various custom elements that you would expect to see in a business card theme. You may be caught off guard by this selection – after all, the screenshot does not look particularly exciting. In fact, there was not even a demo theme to take a screenshot of, so instead you see above the homepage for the theme. But do not be fooled by Annotum Base’s unassuming exterior – what we have here is more than just a theme. 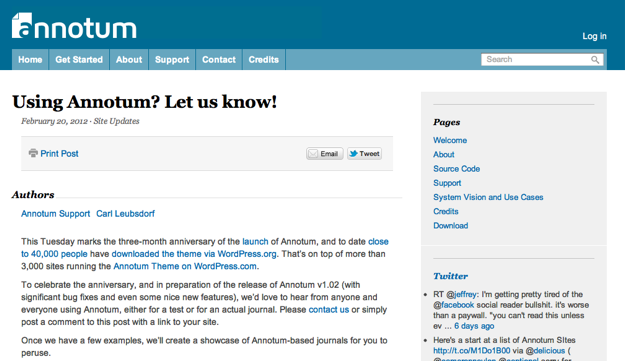 For those of you who don’t know, Annotum is an open source journal authoring and publishing platform. Its developers want it to become the standard for scientific publishing. Instead of working with blog posts, you publish articles that adhere to a specific standardized structure. In a nutshell, Annotum allows you to create and publish scientific journals in a relatively straightforward manner – something that the scientific publishing community has been crying out for. It may not appeal to many, but for the few, Annotum Base is a godsend.